Whether realized or not, the design of our surrounding environment influences how we engage, learn and develop. A playground is a social space, and every child is different. That’s why we design playgrounds that honor each child’s pathway, while offering fun and exciting new challenges. 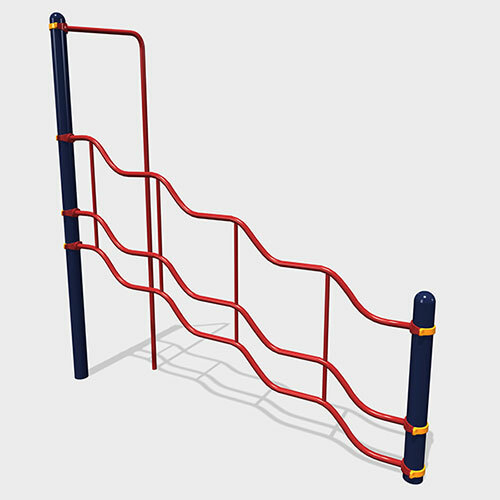 It’s possible to create unique playground designs at an affordable price tag. Incorporate Smart Play®: Venti® along with freestanding play components like our Rhapsody™ Outdoor Musical Instruments to create a unique space with a variety of play experiences. Playgrounds come in all shapes, sizes and styles. You can bring a fantasy world to life by incorporating customized playground components into your design. Watkins Regional Park in Upper Marlboro, Md., based its design on the story of L. Frank Baum’s The Wonderful Wizard of Oz. Or use custom playground design to celebrate the heritage of your community. The Wabun Picnic Area at Minnehaha Regional Park in Minneapolis, Minn., steps back in time with a thematic nod to its origins as an auto tourist camp. Bring children and families of all abilities together for play with an inclusive playground design. By keeping the needs of all users in mind during the design process, you can create a play environment like the Jonesboro Miracle League Park in Jonesboro, Ark., that increases access, safety, comfort and social participation. The great outdoors is the number one spot where kids can play naturally—making up their own games while freely exploring the world around them. The playground on Tom Sawyer Island at Amelia Earhart Park in Hialeah, Fla., helps promote outdoor adventure with its recycled wood-grain panels, woodsy color scheme, and nature-inspired climbers that mimic rocks, mushrooms and logs. Learn more about how you can #MakeYourMark in playground design by viewing our infographic, then contact your local playground consultant to get started on your next playground project. When we collaborate with you to create a playground design, our goal is to help you create a complete play environment. One way we’re focusing on this is by offering three site furnishings collections that match our playground equipment as well as the surrounding landscape. Whether you’re focused on creating a modern, traditional or nature-inspired project, our site furnishings collections will help put the finishing touches on the play environment. The Designer Collection’s modern style and architectural details are the ideal complement to our Evos® and Weevos® playsystems. 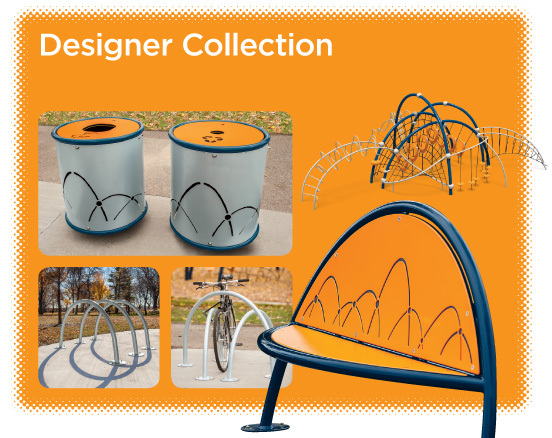 The Arches Bench, Bike Racks, and Recycling and Litter Receptacles will accentuate your contemporary playground design. 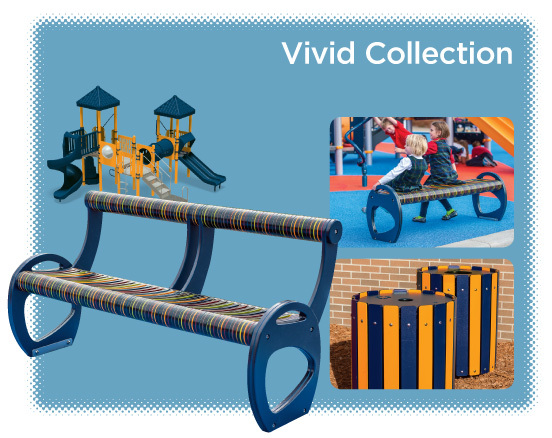 You can plan on pairing our classic PlayBooster®, PlayShaper® and PlaySense® playsystems with the Vivid Collection. The colorful Kaleidoscope Bench, and Recycling and Litter Receptacles, along with the Loop Rack and TenderTuff Picnic Tables and Benches will coordinate perfectly with traditional playgrounds. 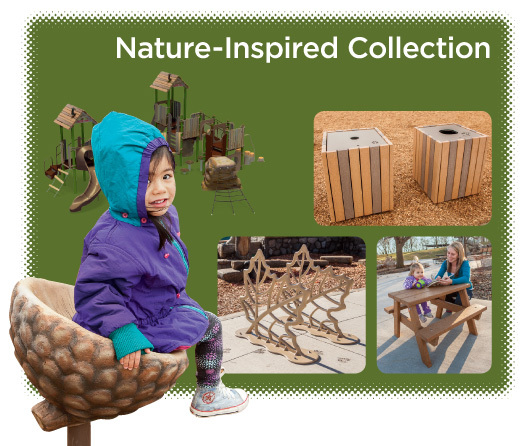 Extend your nature-inspired playground environment with the distinctive Nature-Inspired Collection. The Log Bench, Acorn Seat, Leaf Bike Rack, Wood-Grain Bench and much more will help complete your play space and blend in harmoniously with the natural environment. The three new collections add to Landscape Structures’ already extensive site furnishings offerings. Learn more about the new Designer, Vivid and Nature-Inspired Collections at playlsi.com. While there, check out our other site furnishings like CoolToppers® shade systems and Welcome signs.